I was a student of New Era School and I will not hesitate in accepting that a full scale Proselytizing goes on in the school in the name of Children Moral Classes. To be honest I have to say here that I did accept the Baha’i Faith for a while for which I was given a declaration card to sign stating that I believe in Bahaullah and Abdul Baha. Therefore I was not at all surprised to see your blog which points towards the Baha’is Proselytizing the Faith to the tiny tots in the Schools in India in the name of Community development. The methods adopted by the Baha’is are dangerous and deceptive as the children are not mature enough and cannot realize what is the actual purpose of these courses. But the fact is that whatever Baha’is are doing is just the order of their apex organization the Universal House of Justice. To support my point, I am reproducing the following extract which has been taken from Baha’i newsletter, ‘Reflections on Growth’ – Number 25, August 2009, Page 6 Prepared under the auspices of the International Teaching Centre for the institution of the Counselors. For reading this Message one should first understand the secret Baha’i vocabulary. When studying Ruhi Institute Book 6 “Teaching the Cause,” we learn to distinguish between sharing information about the Faith and conveying concepts that will help a seeker recognize the station of Bahá’u’lláh and embrace the Cause. The teaching method that participants strive to emulate is the one informally referred to as “Anna’s presentation.” This is offered as a model of how to teach the Faith directly, with the aim of inviting an individual to join the Faith at the end of the presentation. Believers all over the world have been striving to align their teaching approaches with the learning acquired in Book 6 and are recording outstanding results from this direct method of teaching. A few words should be said in relation to the term direct teaching. Shoghi Effendi Characterized direct teaching as “an open and bold assertion of the fundamental verities of the Cause” whereas indirect teaching, he wrote, is “a less direct and more cautious method of teaching,” consisting of presenting ……..
A well-prepared home front pioneer can affect the lives of many people and become the catalyst to rapidly accelerate the development of a community. One such sterling example is recounted below. A curious 16-year-old noticed a group of people in another village studying together. When he inquired about what they were doing, he became intrigued by the quotations they were discussing and asked the tutor if a similar course could be held in his own village. He and the tutor arranged to carry out a 22-day institute campaign, and he made certain that his friends and relatives attended. However, this same youth was unable to attend the sessions regularly. He was determined to go through the full sequence of courses properly and was sent to the residential Intensive institute courses held at Panchgani. The experience of this youth at Panchgani proved to be extremely useful because there the service component was emphasized, enabling him and his fellow participants to build different capacities. During his time there, that youth resolved to give three months of service to the Faith when he completed the sequence. After only a few days back home with his family, he left to serve as a short-term pioneer in a neighboring cluster. In the beginning, this stalwart youth faced many challenges at his post. The participants of the first study circle he started were not serious. Then with another Bahá’í he taught the Faith to 10 people in a different locality. They started a study circle for those 10 and finished Book 1 in four days, but the participants did not attend regularly. Then they started having the classes weekly. Six participants went through the sequence of courses up to Book 6. Slowly he was learning to keep the participants motivated to go through the program. This young pioneer also made sure that, along with studying the text of each book, his participants carried participants carried out acts of service. Thus, when they finished Book 1, he asked them to start devotional gatherings. After Book 3, he encouraged them to start children’s classes. Some of them joined him in teaching while going through Book 6. Then the pioneer started another study circle in a third locality. There were four participants in this study circle who moved up through Book 3. Consequently, within months, this pioneer was directly working with 10 people: six in Book 6 and four in Book 3. But that is not the complete circle of influence of this inspiring young man—through those 10 people he was able to influence the lives of more than 100 others! The total activities established by participants of his study circles included 6 regular devotional gatherings, 3 children’s classes, and 1 additional study circle, which all together attracted a total of 104 participants. In addition, many of these friends are now taking part in teaching teams during collective teaching campaigns. 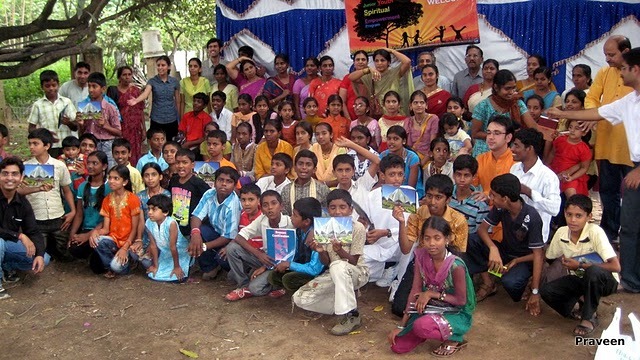 From the time New Era school has been established there are cases of 500 conversions to the Faith. Countless others are sympathetic and support the cause by large donations – cash and kind.